VGLeaks has unveiled the raw system specs of Microsoft's next generation console dubbed Durango. If these specs hold up, the next "Xbox" will have some remarkably impressive processing power at 1.2 teraflops (1.2 trillion floating-point operations per second). To put that in perspective; Xbox 360 is only measured in gigaflops. After the failure of HD DVD in the current generation, it is also a notable point that Blu-ray will be included along with 8GB of RAM, Wi-Fi Direct capability, USB 3.0 and HDMI 1.4a. Unlike the latest report for PS4, there is no news on the controller nor the previously rumored augmented-reality glasses. 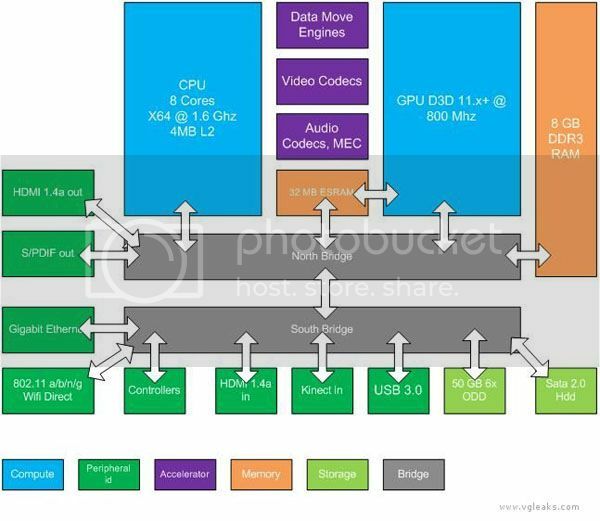 CNET: Xbox 720: 8 CPU cores of gaming power? I've never owned any xbox's before. Maybe I'll get this one at some point. What are the primary xbox exclusive titles? Is it mostly Halo? Or are there other game series I should look at? To me 1st party exclusives are going the way of the dinosaur. Nintendo is really the only company that clings to theirs and there position in the gaming world today doesn't speak volumes. Most of the exclusves today come from smaller studios that do the PS store and XBL arcade games. 3rd party have gone to "timed exclusives" because there is way too much money to be made by selling product on all consoles. MGS is now making its way on to Xbox, and I can only see many more titles in the future now that this console will support bigger blu-ray discs. When I first got an Xbox 360 it was because thats what all my friends were playing on. As I've used it over the years, My PS3 has become a netflix/blu-ray player that is only for a small handful of titles. God of War III, MGS4, Mortal Kombat, and Twisted Metal are the only games I've ever bought for it. Xbox Live is a superior product to the PlayStation Online. Sony may have improved it over the years, and Plus might have made it come close, but XBL is still the better online platform IMO. Trying to play Twisted Metal online was a nightmare on match making alone. I never did get to try it because the damn thing would never find a match paired with a friend. On a side note, in my opinion everyone should use the COD lobby style for match making, that is probably COD's greatest accomplishment. I've always viewed Xbox as a FPS / Racing console. It lacks on RPGs which I do not play. Its more of a western gaming console which is why its such a failure in japan. Within that thought, the controller is designed more for these types of games. The trigger buttons work better for COD, BF, Borderlands, and racing games. They feel more natural. On the same token, the D-pad is horrible unless you buy the special controller with a good D-pad. I cant play games like Mortal Kombat or Street Fighter on xbox, because I've never been able to use a joy stick for fighting games. In the end its really based on your preference of style and games. I wont be able to afford both systems this generation like I have in the past. I'll be going with Microsoft because of their stronger ties with COD (Timed exclusives on map packs ) and becasue I like Xbox Live. I'm also seeing more innovation with the Kenect room projector, and the possibility of augmented-reality glasses. Once you start requiring me to move my controller around and look at it, its just bothers me. I'm an old fart that likes a damn controller with just buttons. You can mess with everything else, just not my gamepad. lmao. What if the next xbox has a touchscreen controller too? Interesting indeed. 500GB HD on board? Wow. Mandatory Kinect with every system. Thats interesting. It is an interesting addon and as long as they force it on everyone game developers will be able to utilize it better. As long as game developers don't expect me to be standing up to play games and don't auto-record me or anonymously track my reactions to scenes for development purposes I'll be ok with it. That and the system better not error out whenever the camera is covered with a towel. I don't like cameras pointed at me when they're not being used for something visual. I'm sorry Chris... I'm afraid I can't let you do that.